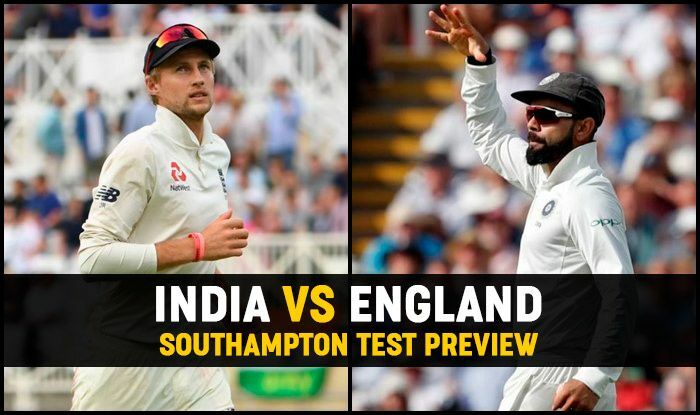 India vs England: Southampton, Aug 30 – India will take on England in the fourth cricket Test starting at the Rose Bowl Ground here from Thursday. England are leading the series five test series 2-1. After a narrow 31-run loss in the first Test at Edgbaston, the visitors suffered an innings defeat at Lord’s and were on the verge of losing the series. However, the Virat Kohli-led Indian team bounced back in the third Test to register an emphatic 203-run victory, keeping the series alive. Kohli’s side still trail 1-2 in the series and will be eyeing to replicate their previous show to level the series before going to the decider. With Murali Vijay axed from the remainder of the series, Shikhar Dhawan and Lokesh Rahul would once again open India’s batting, while Hardik Pandya is likely to be retained in the playing XI after his all-round show in the third Test. Hardik had bagged six wickets conceding 50 runs at Nottingham beside playing an unbeaten 52-run knock in the second innings. In the bowling department, the visitors would in all likelihood opt for three pacers, keeping in mind the green-top laid out for the fourth Test. The trio of Jasprit Bumrah, Ishant Sharma and Mohammed Shami returned a handful from the third Test, with Bumrah’s fifer ripping through the English batting order in the second essay. Ravichandran Ashwin is expected to recover from his injury and will shoulder the responsibility as the lone spinner in the side, and in case of a forced change, left-arm spinner Ravindra Jadeja is already warming the bench for the first three Tests. On the other hand, England will hope their misfiring opening combination of Alastair Cook and Keaton Jennings to give them a decent start. England’s batting so far, has revolved around the likes of skipper Joe Root, Jos Buttler and injured stumper Jonny Bairstow, who is expected to play as a specialist batsman in the fourth Test. Batsman James Vince was called up to the England squad as cover for Bairstow, but there are growing calls for his inclusion into the playing eleven nevertheless. The bowling unit will once again be on expected lines with the star pair of James Anderson and Stuart Broad leading the attack that comprises all-rounders Ben Stokes and Chris Woakes. It will be interesting to see whether England will persist with leg-spinner Adil Rashid or bring in an additional batsman and part-time spinner in Moeen Ali to bolster their batting. India: Virat Kohli (Captain), Shikhar Dhawan, Prithvi Shaw, Lokesh Rahul, Cheteshwar Pujara, Ajinkya Rahane, Dinesh Karthik, Rishabh Pant (WK), Karun Nair, Hardik Pandya, Ravichandran Ashwin, Ravindra Jadeja, Hanuma Vihari, Ishant Sharma, Umesh Yadav, Shardul Thakur, Mohammed Shami, Jasprit Bumrah. England: Joe Root (Captain), Alastair Cook, Keaton Jennings, Jonny Bairstow (WK), Jos Buttler (WK), Oliver Pope, Moeen Ali, Adil Rashid, Sam Curran, James Anderson, Stuart Broad, Chris Woakes, Ben Stokes, James Vince.